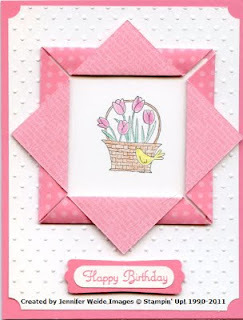 Back to cards by Sharon!! Sorry to be so long getting back to these! I've worked a few extra days lately, at an office almost an hour away so I haven't had a much time to get posts done in addition to all the other things I have to do!! Here is card three that Sharon had for us last weekend at club. 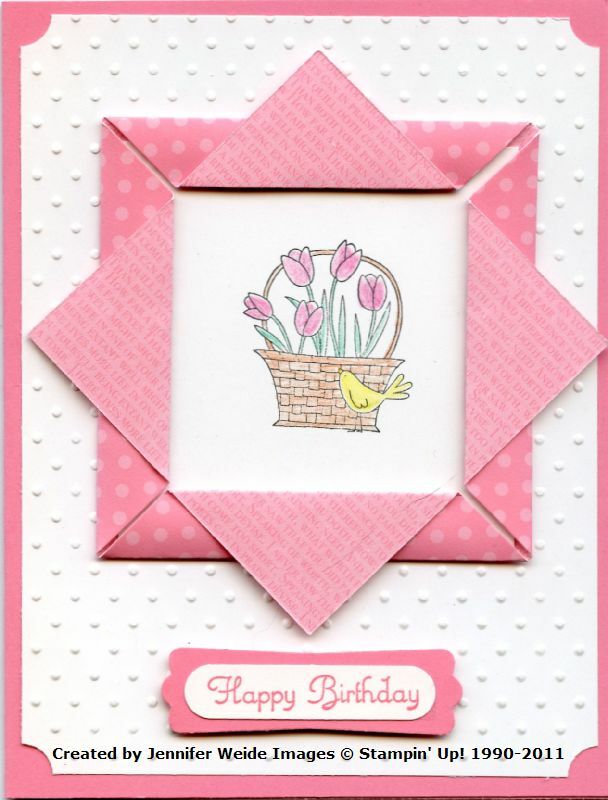 The card base is Regal Rose with a background of Whisper White that was embossed with the Perfect Polka Dots folder in the Big Shot. Sharon gave her Big Shot quite the work out getting ready for us!! In the center is a DSP square that we scored and folded to frame the flowers. We put dimensionals under the folds to give the frame dimension! We stamped the flower image of our choice from A Flower for All Seasons in Basic Black. I chose the basket of tulips. We colored them with the Watercolor Pencils. At the bottom is the Happy Birthday again from Create a Cupcake on the Word Window Punch, layered onto the Modern Label Punch and attached with dimensionals.